No, not the Britpopping Welsh group behind Road Rage and Mulder and Scully. 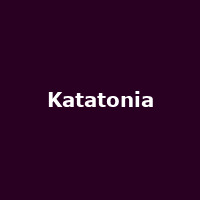 This Katatonia-with-a-K speaks of a much deeper melancholy than Cerys Matthews' charges and their Dead From the Waist Down or Bleed. Formed in Stockholm in 1991, after a stuttering start, Katatonia have grown into Scandinavian giants of doom-metal. At the band's dark heart remain guitarist Anders Nyström and singer Jonas Renkse, who have overseen the composition, production and direction of the band through eight studio albums of blackened gloom metal. Now a five piece, the line-up includes lead guitarist Per Eriksson, aka Sodomizer. Told you it was dark. A ninth album, Dead End Kings, is released in August and, following a US tour which sees Katatonia team up with The Devin Townsend Project, the quintet will be hitting this shores in the run up to Christmas. The promise of the festive season set against shortening days and the early chill of winter seems tailor-made for Katatonia's brooding rock motifs. The UK tour kicks off at the Islington Academy on 10th December, followed by shows across the country including Manchester, Belfast, Newcastle and Southampton, before the final date at The Fleece in Bristol on 20th December 2012. We have tickets available now, priced £16 for the Islington gig and just £14 for the remaining UK shows.